If you want more writing work, this is for you. 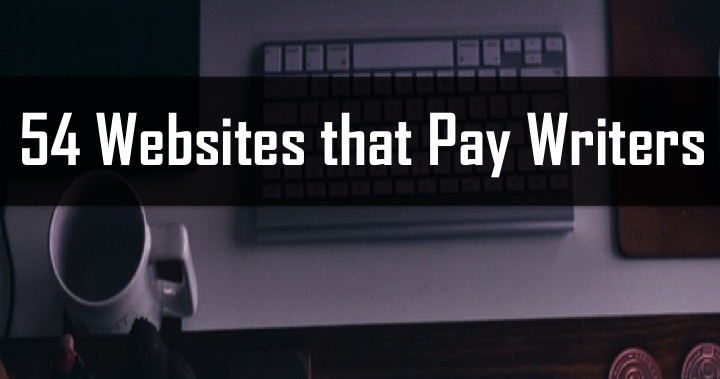 Each of these websites pays writers for online writing. This list includes blogging sites, revenue sharing sites, content mills, and more. Even if you already have enough writing work, this list is still valuable. The key to continued success with freelance writing is to find back-up options to use when you find the “pickings are slim.” However, for many writers, this presents another issue – finding places to write that offer writing assignments when your usual work as dried up. Well, you’re in luck! Here you will find 54 writing platforms you can sign up for or apply to so you have a backup source of income when writing work is slack. Obviously, not all of these sites will be right for every writer. Our hope is that some of them will be a perfect match for you, even if many aren’t quite right. In addition to the actual name and link to the platforms, you will also find out what you have to do to get started, which may help to save you time in finding the best ones for your skills. Zerys To apply, you have to fill out a simple form and provide a writing sample. You will be provided a rating, which will also determine the amount you get paid from the platform. There are articles added each day, so there is usually a good supply of work. Zerys pays twice monthly, on the 1st and 15th via Paypal. Writer Access This website pays writers to write articles for a wide variety of clients. They expect complete anonymity from their writers, but they are one of the better writer platforms online. Contently This website allows you to create an online portfolio for your writing. This portfolio can be used to show your potential clients. But, the editors of Contently also might contact you with writing opportunities. They tend to pay good professional level rates. Media Shower This is an online writing platform that offers writing assignments for a variety of websites. The pay is not particularly great, but it is decent for new freelance writers. People Per Hour This website lets you find freelance writing jobs on your own terms. You can create an offer for your services or browse work that employers are offering. Click the link for a full review. Textbroker This site is appealing because it offers opportunities for writers with no previous experience. When you sign up, you will submit a custom sample, which will be rated by the editors. Accepted writers will be given a 2, 3 or 4 star rating and can accept projects from clients with these levels of jobs. Your work is constantly evaluated, so as your writing improves, you will have access to the higher paying jobs. Textbroker pays out when you reach a milestone of $10. Triple Curve Here you will find a very basic writing application. You simply need to fill out the form with your basic information and then include two 500 word samples. The editors will contact you if your writing meets their needs. If you search the company, you will find that it has very high feedback ratings from users and offers a wide array of projects for you to work on at any given time. Article Document Article Document is essentially a platform where you can choose from the assignments submitted by clients. Each day new assignments are added to the list and there is no minimum amount of articles you can complete. When you sign up for this site, you will complete a writing sample, which will be rated. The rating you receive will determine how much you earn writing on the platform. Article Document pays via PayPal and is currently only open for U.S. residents. Scripted This is an online writing platforms with many writing jobs available. They pay up to $25 per article completed. The application is relatively straightforward, but you will need to meet their standards before being accepted. eCopyWriters This is a relatively new writing platform. They still have some bugs to work out. But they’re developing a decent reputation. They don’t currently have a lot of work available, but that could change if they grow and become more established. GetaCopyWriter We’ve actually hired writers from this website. The process was relatively straightforward. We put in a request for an article, and 4 potential writes were allowed to submit proposals. Writers get paid a flat rate. We ended up accepting 2 of the 4 proposals. The process was smooth, and the pay for the writer seems to be relatively fair. Fiverr This websites operates on a very simple idea. What would you do for $5? The answer to that question becomes your offer. Potential buyers browse the offers and then buy the ones they want. What would you write for $5? 100 words of text? Edit a page of writing? Many people earn a surprising amount of money offering just these services. Article Sale On Article Sale you can sign up for free to sell your articles. Here you post unique articles you write and then a price that you charge for the content. Anyone looking for content can come to the platform and purchase what you have to offer. The site is completely free and if an article is purchased, you are paid via PayPal. Crowd Content Crowd Content accepts writers from AU, UK, CA and the US. They may also accept other countries, but this is not stated on their site as of now. When you are accepted to the platform you have the potential to earn between .02 cents and .066 cents per project. They pay via PayPal twice a month. AutoShopper AutoShopper currently accepts writers from the US, Uk and Canada. The site is all car-related, so it is important that you have an interest and knowledge regarding this topic. The site pays between $10 and $20 per piece once your application is accepted. Currently they do not have an online application for the writing position, but you can contact the site administrator to begin the process. Green Light Articles Green Light Articles has a fairly easy application process and once you complete it and you are approved, you have access to a number of different writing assignments. Most writers begin at a rate of $1/100 words, but as you complete more work and meet deadlines, this rate will increase. Beacon Fire There is no online application for Beacon Fire; however, they are constantly searching for new writing talent. If you are interested in writing for this site, you need to submit a cover letter, along with your resume, compensation expectations and three work samples to them at contractor-copywriter@beaconfire.com. There are also a number of other positions, including designer, which the site is hiring for. BlogMutt BlogMutt is another writing platform where you are paid for your article submissions. When a client likes what you provide, you get paid through PayPal every Monday. The application process is fairly straightforward and you can select the assignments that you write. When your work is accepted, you will receive $8. Break Studios This is another pretty straightforward writing platform where you are given a title and you provide the content. The site pays via PayPal twice each month and each article is worth around $8 with a minimum word requirement of 250. The application process is easier than some of the other platforms and you do not have to submit any writing samples ahead of time. Buy Keyword Articles The application process is a bit more extensive for this site, which is referred to as BKA Content. Once you have submitted an application, you will be contacted to write a custom sample. If approved, you can begin writing and will receive payment every two weeks through PayPal. The starting pay is one cent per word, but there are opportunities to move up and make more money. Content Current Content Current is hiring reliable writers for custom writing tasks. You can make your own schedule and take as much – or as little work as you want on this writing platform. There are three steps in the application process including filling out the registration form, completing the author’s quiz and submitting a writing sample. This writing platform pays once weekly. Content Divas In order to apply to write for Content Divas, you have to submit samples (they have outlined) to the provided email address. If you are accepted, you will work through the Basecamp platform. The pay rate for this writing platform is approximately $18 per 1,000 words, which means there is the potential to earn a significant supplemental income on this site. Content Runner This article marketplace allows you to write articles and then post that they are for sale. The site will only pay if you have a US based bank account. When you click on the Content Runner link here, you can find the registration page by going to the bottom of the main website page and click the “Useful Links” heading. The pay can be set by you, and if a person buys your content, you are paid. Copy Press This writing platform hires freelance writers based in Australia, the United Kingdom, Canada and the United States. You have to submit your application and writing samples. The approval process can take up to 10 days, but once approved you will receive writing assignments right away. The site pays via PayPal twice each month. Cracked According to the site, you can make as much as $100 for your first approved article. If you are successful on Cracked and your articles are published, you will also receive a byline, which means you can make money and build your portfolio. Demand Media Demand Media offers a process where you apply to be a writer and once your account is approved, you can make between $7.50 and $20 per piece. This is based on what departments you apply to and approved to write in. Demand Media will pay twice each week through PayPal. Distance Web Distance Web is always looking for prolific writers who can create copy for email marketing, web sites and ads. The application process is fairly simple and you can begin writing as soon as you are approved on the site. Distilled This site is hiring freelance writers from a number of different backgrounds, who have different skills and interests. In the initial application, you submit examples of your writing, what you are interested in writing about and what you expect to be paid. If your application is approved, you will begin to receive writing assignments right away. Ezdia This site occasionally hires content writers, as well as editors. Writers report earning between $1 and $150 per piece, based on the length and ability as a writer. There are all types of different content to accept and write when you sign up with Ezdia. Get a Copywriter The application for this site is pretty straightforward and requires your personal information. If you are accepted as a writer, you can earn between $5 and $9 per 100 words, which is much higher than a number of the other writing platforms that are available. Hire Writers Anyone can sign up for this site and begin writing right away. However, when you first sign up, you will only be able to accept the lowest rated and paying jobs. As you write more and meet deadlines, your ability to accept higher paying jobs will increase. When you reach the highest level, you can make up to $20 per article. It is important to note that if you miss a deadline, the site will take money out of what you have earned. This site pays through PayPal. iWriter This site is extremely similar to Hire Writers and requires you to work your way up to the higher paying jobs through satisfied customer reviews. Some of the highest paying jobs offer as much as $5/100 words. Unlike Hire Writers, this site does not require you to pay if you miss a deadline. They pay out PayPal every Tuesday. Writers Needed In order to write for Writers Needed, you have to fill out the basic application form, include two to three samples and wait for approval. Once you have been approved for writing, you will gain access to the writing projects. The site pays via PayPal and require that you remain active in order to keep your account from being deleted. Search Sciences Search Sciences is hiring UK and US based writers and requires you to submit an initial application. When they open their writing platform up they will let you know by giving you access to the platform. While the initial pieces are giving are considered tests, they will work with you to help you learn what type of writing their clients expect. When you finally begin writing with them full-time, you can expect to make up to $15 per article and be paid through PayPal. WordGigs WordGigs is an online writing platform that allows you to fill out a simple application, submit a sample and start writing. Their basic articles which are 350 words pay $4.50. They have a good supply of work, with some writers making over $500 with this platform every two weeks. They pay via PayPal on the 1st and 15th of each month. Words of Worth This writing platform is open to anyone in the US, France, UK, Germany or Canada. There are also several other countries where writer’s are accepted. Here you will sign up for the platform, submit a writing sample and then start writing. The site pays via bank transfer one time each month. London Brokers London Brokers is constantly hiring talented writers. There is no degree requirement but you do have to be able to write well. The pay ranges from $2 to $6.50 per article based on the word count. Once you sign up, you can begin choosing assignments from the writer’s board. This site pays out via Payoneer or PayPal. PureContent This site hires both writers and editors. A familiarity with UK English is preferred. This site will pay each month through PayPal or by direct deposit depending on your preferences. Plum Deluxe Here writers can get paid up to $30 per accepted feature. This site also gives writers a byline, allowing them to increase your portfolio. The topics that are readily available on this site include style, health, goods, home, drink, food and travel. It is important to note, this site offers more of a one-off writing opportunity, rather than a consistent source of work. Search Influence For this site it is important that you have a basic understanding of SEO content. They supply accepted writers with the article topics, as well as keywords and any other important information. It is essential to meet their deadlines, which is typically 24 hours. SmartBrief This site offers a fairly easy application process, requiring basic information and a writing sample. Once approved, writers can find journalist and writing jobs regularly posted. In many cases, the pieces are news-related writing. In order to find the at home positions that are currently available, type the term “freelance” into the search box. Student Experts The application to become a content writer here is fairly simple and creativity is rewarded. Once the application is approved, writers can complete writing assignments. Do not expect to earn a large amount of money. In most cases, you will be creating various blog articles for small businesses. TextMaster This site offers a platform or writing jobs for you to choose from. They are currently hiring writers, proofreaders and translators. It is important that you send your best writing samples in order to be considered for the position. The work that is available varies, but it is a good site for earning a bit of extra money. The payments are able to be sent via PayPal once you have reached $65. Ultius This website has an application process that is a bit more involved than others. You must submit your initial application and samples and also go through an interview process. If you are approved, expect compensation that typically ranges between $10 and $19 per page. They pay through PayPal every other week. WL Marketing The application process for WL Marketing is fairly simple. You need to submit a few samples and the points of your resume. It is also important that you outline your availability and desired salary in the application. This company offers SEO writing for clients and have an ongoing need for good article writers. Wizzley Your content on Wizzley can earn though Adsense, Chitika, AllPosters, Zazzle, and Amazon. Xomba Make money with Adsense and receive a 60/40 split when you sign up for Xomba. Unanchor Get 75 percent of revenue share from your published travel itineraries sold. Zujava– Zujava will share the revenue from your content with you 50/50. They have more options for making money than some of the other revenue sharing websites. Writing new, unique content for pay is not the only way that you can earn money. Do you love to read? Try out other products? If so, there are a number of review sites that will pay you for your opinion. You can pick the ones that are most appealing to you and then supplement your income by telling companies what you think! Music Emissions On Music Emissions you can get paid to listening to music and giving your opinion. Los Angeles Restaurants If you live in the Los Angeles area, you can be paid to eat at and review local restaurants. Review Stream Receive $1.50 for each review you write and an additional .10 cents for each vote you receive. There is no question that there are a multitude of opportunities for you to earn money online. Knowing where to look can make all the difference in earning money or sitting ideally by watching others benefit from all the sites out there.